Dreamy arrangements of luxuriant blooms, paired to stylish perfection, prevail as the ultimate wedding-day accessory. 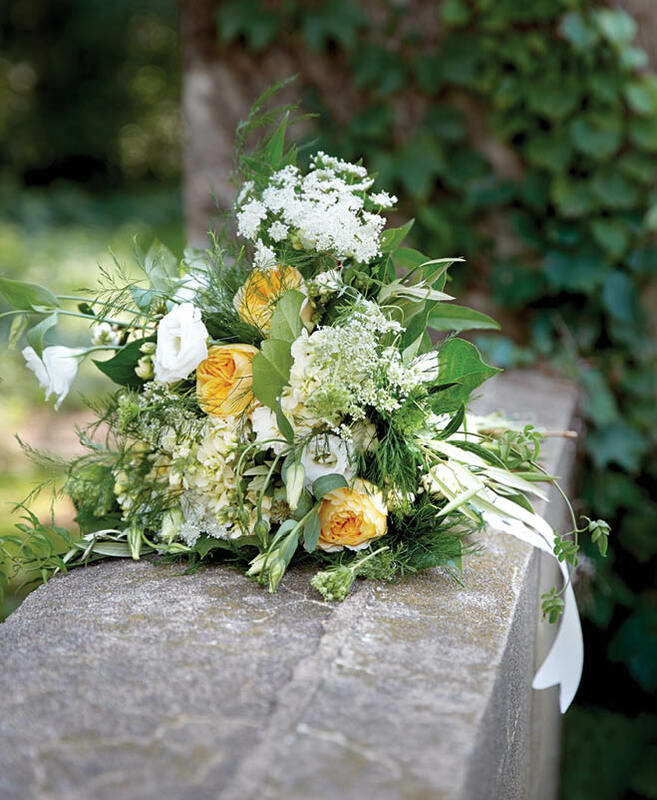 (above) Bloom Designs mixes lush silver dollar and seeded eucalyptus with ultra-romantic Prince Jardinier garden roses, tuberose, snapdragons, Carla Romantica spray roses, Candy Bianca roses, snowberry and hypericum berries in an ebullient garland that sweeps softly to the floor. 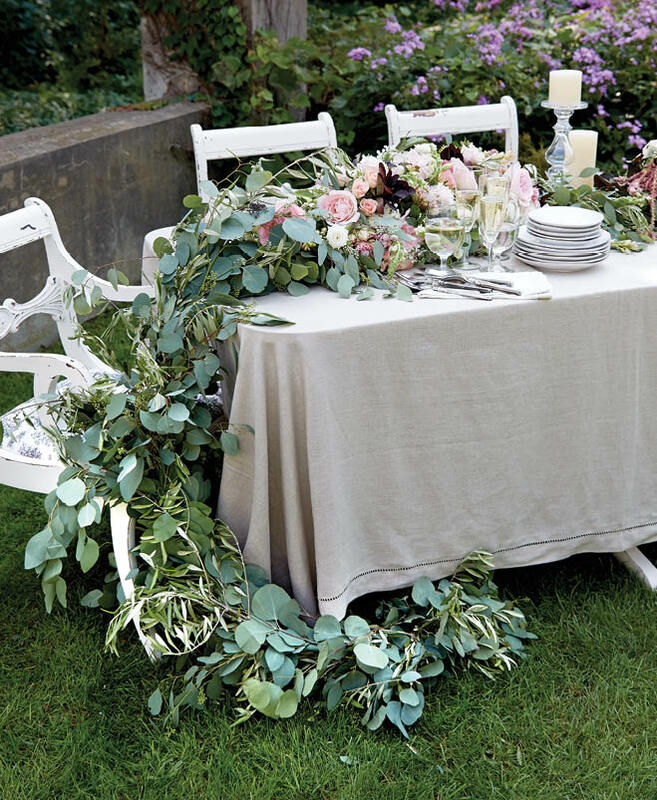 A table and chairs from A Vintage Touch set the scene for a show-stopping tablescape. Locally grown blooms like zinnias, French vanilla marigolds and hops lay the foundation for this luxe, garden-fresh centerpiece from Luna Vinca. 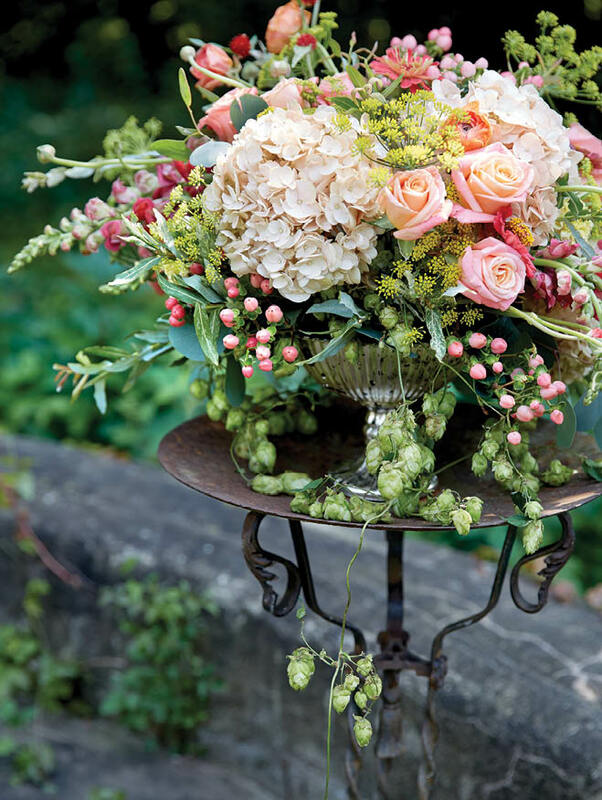 Hydrangeas, ranunculus, dill, snapdragons, Miss Piggy roses and gomphrena complete the masterpiece, which sits atop a rustic metal flower stand from A Vintage Touch. Cheery “Charlotte” David Austin garden roses pop among a blissful white wave of Queen Anne’s lace, stock, lisianthus, snowberry, salal and jasmine vine. Soft green poppy pods, plumosa and olive branch form the serene base in this summery bouquet by Lake Harriet Florist. 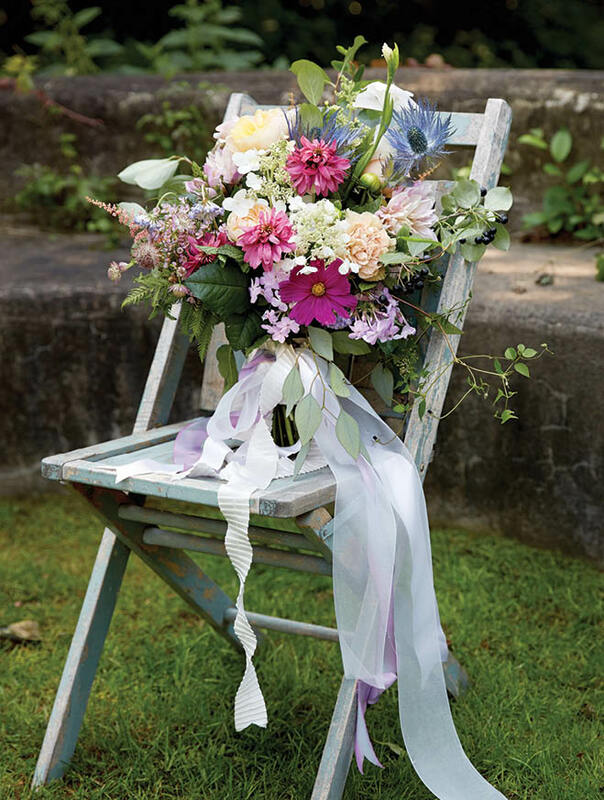 Spring awakens in this so-sweet bouquet from deBruyn Designs, which rests on a delightfully distressed chair from A Vintage Touch. A veritable garden of blooms combine—Café au Lait dahlias, Autumn Joy sedum, Juliet garden roses, Terracotta Caramel antique carnations, chelone glabra, scabiosa, clematis vine, Strawberry hydrangeas, Tardiva hydrangeas, Sea Star thistle, gladiolas, astilbe, alstroemeria, astrantia, garden phlox, Gum Drop echinacea, cosmos, wax flowers, black chokeberry, seeded eucalyptus, Sprenger’s asparagus, ferns and mint—tied together with a fashionable panoply of organza, silk, pleated satin and antique lace ribbons. Just Bloomed takes the rose-hued bridal bouquet to gorgeous new heights. 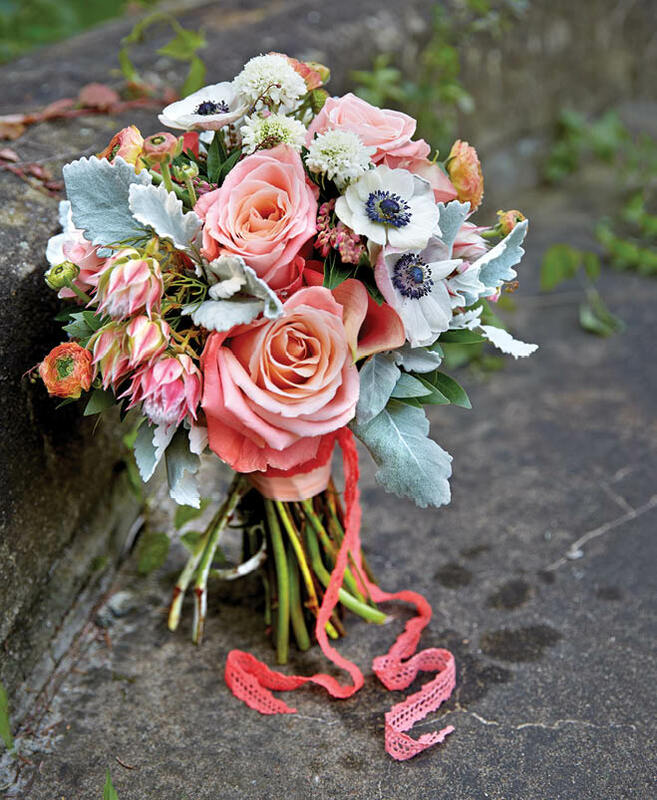 Here, white anemones, Andromeda heather, ranunculus, Blushing Bride protea, mini calla lilies, white scabiosa, roses, dusty miller and bay leaves are wrapped with a romantic coral cotton lace ribbon that dances down to the ground. 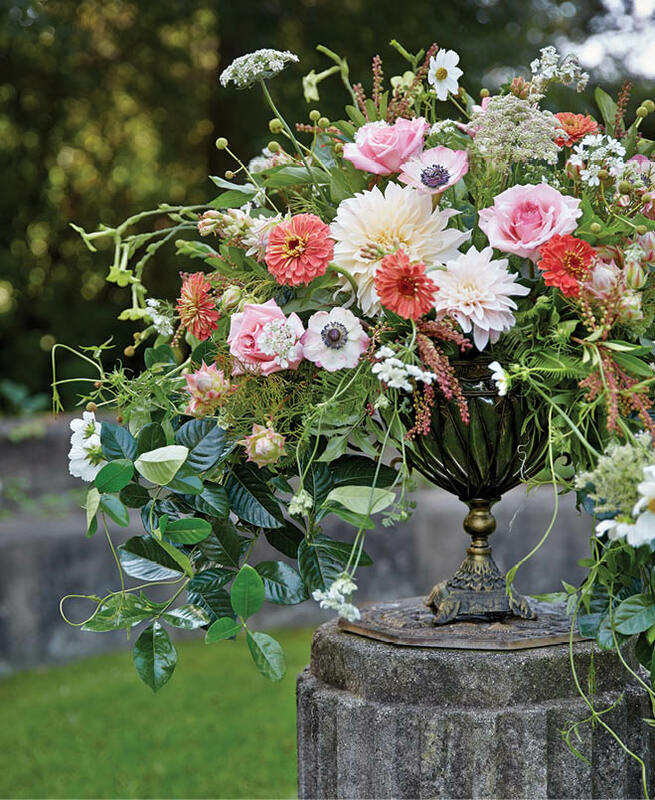 A plume of petals—zinnias, Blushing Bride protea, gardenia foliage, jasmine vine, Queen Anne’s lace, tuberose, Café au Lait dahlias, Pink O’Hara roses, nicotiana, Andromeda heather, astrantia, white cosmos and anemones—cascade from a footed vase in this fanciful, free-spirited centerpiece from Wisteria Design Studio. Cedarhurst Mansion offers a historic backdrop for any wedding or private event. For rental information, call 612.339.0222. Kathy Hallblade, A Vintage Touch, 612.281.5523.